Our time with the Saint Louis Rams has been an amazing experience. At the time of this blog post, we have now been working with the organization for over 4 months. We began with the Rams as a requirement for our summer field experience which lasted from the middle of May through the month of July. After the completion of our summer field experience, we were presented with the opportunity to continue our education with the Rams. We were invited to stay for the remainder of the year; from the beginning of training camp to the completion of our academic school year in May 2016. Every day at Rams Park is action packed. We typically begin each morning by preparing the athletic training room. This includes setting up the therapeutic modality machines, restocking any inventory, making ice bags, preparing a room designated for recovery for HRV (heart rate variability) readings, and placing GPS units inside the players’ uniforms for practice. From there, we monitor the recovery room during HRV readings, help with any treatments or rehabilitations, and assist with running the vision board for vision training. Usually after this point, the players will go to meetings. This gives us a chance to begin setting up the field for practice. During practice, we are assigned an individual position to cover. Coverage generally includes administering proper hydration and ensuring that any medical necessities are managed. After practice, it is our responsibility to put away all athletic training supplies brought out to practice, including field trunks, medical kits, spine board, etc. We will then head back into the athletic training room and help provide treatments and rehabilitation services. Prior to this clinical site, we have both worked in the high school and collegiate athletic training settings. As you can imagine, the resources that the Rams organization possesses are far greater than that of our prior clinical sites. As a result, our time spent here has allowed us to use a wide variety of modalities that we may not have had the opportunity to use with any other clinical placement. These types of resources and experiences may play an important role in our career, as exposure and familiarity to the best equipment could prove useful in our future work settings. 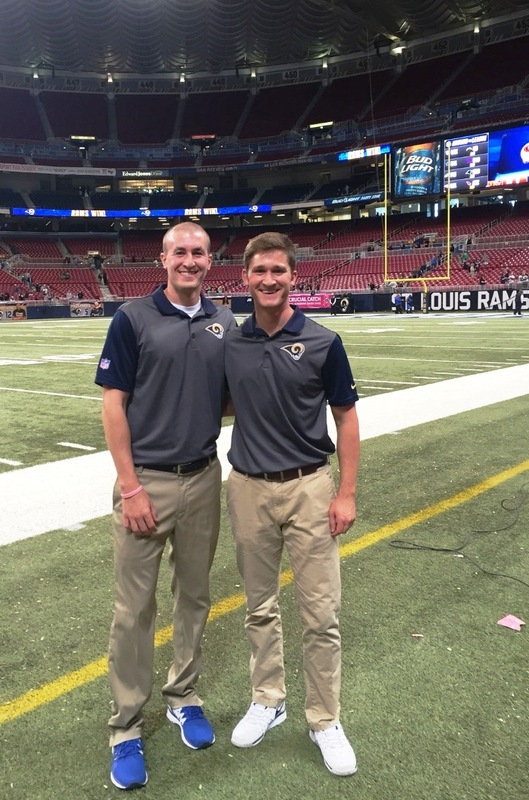 It has been interesting to witness that although the Rams sports medicine staff does have access to more resources than other settings, the profession that is athletic training is still practiced in the same manner; with the main priority being patient-centered care. The time we have spent in the Rams athletic training room has taught us that although we have access to a multitude of resources (expensive modalities, rehab equipment and training aids); the fundamental aspect to this profession is treating our patients with respect and dignity. We cannot give enough praise and thanks to the athletic training staff which consists of the head athletic trainer Reggie Scott ATC, assistant athletic trainers James Lomax ATC, Byron Cunningham PT, ATC, Tyler Williams ATC, and 2015 SLU alum Hilary Stepansky ATC for their willingness and patience to serve as mentors and teachers on a daily basis.